When the Masterpiece Collection by Maurice Lacroix launched, the goal was to produce watches with the brand’s know-how, and the modern feel clients are looking for nowadays. The result was a set of eight watches. Watches that compile contemporary mechanical watchmaking and the retrograde displays Maurice Lacroix has been specializing in for decades now. 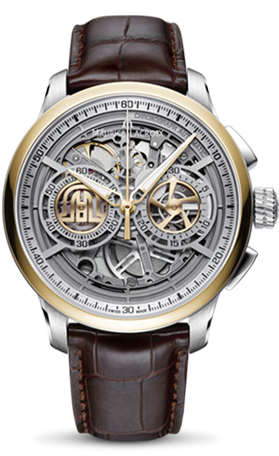 Looking at the eight, we can’t help but highlighting the design of the Masterpiece Chronograph Skeleton , which includes a useful complication, the chronograph. The multiple parts of the movement invites the wearer to look closely at each element of the watch. The 45mm diameter case is available in stainless steel, black PVD or steel with a solid gold bezel. Finally, while most skeletonized watches tend to have minimal water resistance, the Skeleton is water resistant to 10 atm.